Nan arrives from across the bay where she lives in a one-room, concrete house adorned with a thin tin roof to keep off the tropical rain. Like every morning, she rides the ferry through the water towards a pulsing green light perched over the landing in Songkhla. That’s where we meet. The sky over this city in southern Thailand turns faintly blue as the sun awakes. The sea air is thick but refreshingly cool before the day’s coming heat. I follow Nan into the old town, trailing puffs of grey exhaust squirting out from her old scooter. Her preschool daughter sits nestled between her legs on the seat in front of her. She slows to maneuver around a Buddhist monk wrapped in bright orange cloth and parks in front of the market. There she receives a plastic bag filled with fresh vegetables for the restaurant and places it in a wire basket mounted to the front of her scooter. Five blocks later, down Nagm Nagm Road, Nan parks her scooter outside a two-story shophouse. She walks briskly with her things, carrying her daughter towards the building. She passes from outdoors through a side door into the shelter of a kitchen with an extraordinary high ceiling. The walls are pastel blue. Inside, on a shelf almost directly across from the entrance to the door, rest three framed photographs, as if observing the work below. Two of the pictures are clearly older, grainy, and in black and white. The third picture is in color. It’s of a woman in her last years with fleshy skin and short black hair. 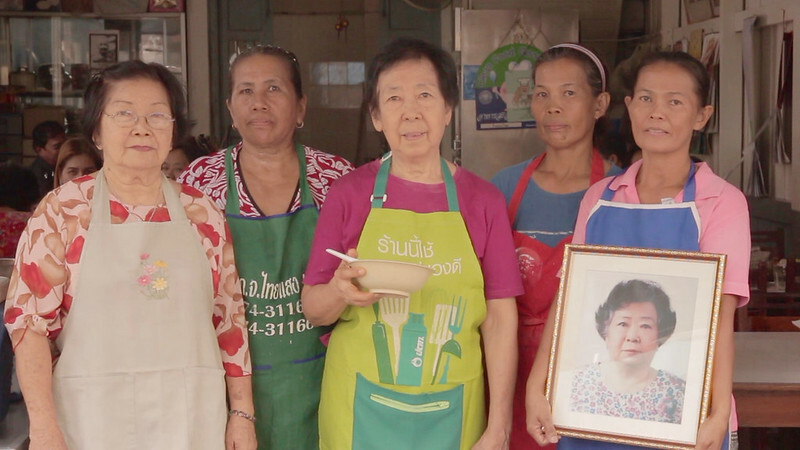 The old woman isn’t frowning, but she’s not smiling either. Her’s is an expression of reserved silence. In the lowest corner of the picture, is the year she was born and the year she died: 2477 – 2558. Nan sets the vegetables on a table. Her daughter greets the other women in the room, clasping her small hands together forming the Wai and bowing slightly at the waist. The child first pays respect to the skinnier of the two women. The thin cook returns the child’s greetings. “Sawadeekaa” she says and then goes back to preparing an oversized pot of hot tea. The child pivots to the other woman, a short, squat cook. The fat one simply nods affirmatively back to the child. Her hands are full. 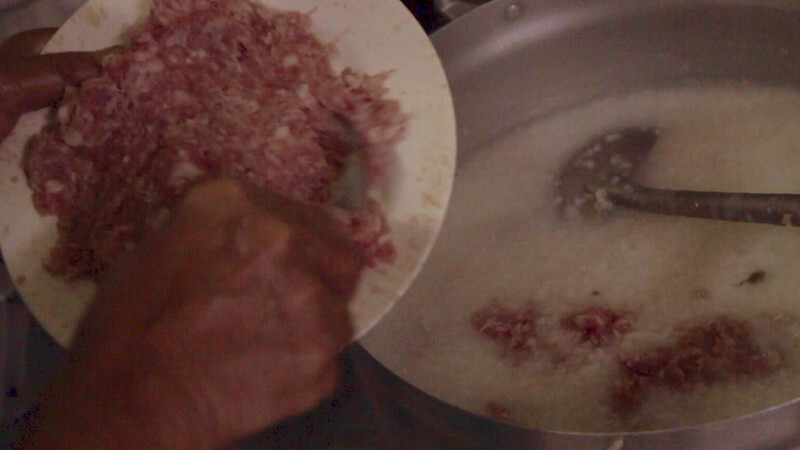 The right hand gripping a spoon, scraping off bite-sized chunks of sticky, minced meat from a small plate into a large pot of boiling rice soup called joh* (also known as congee or rice porridge). After the round cook finishes scraping the plate clean and lowers the gas to simmer, she turns around. Over a table she lifts up a knife and cuts. Steam from the pot drifts soothingly upwards like incense from a slowly smoldering jos stick. Nan’s little girl sits crosslegged on a stoop drawing colorful lines which resembling the swooping arched roof of a Buddhist temple. The skinny cook sets short glasses onto a tray, one after another, while the fat one feeds bits of pork and large knobs of garlic into a meat grinder. Their repetitive movements are meditative, while the three iconic faces watch out from their framed photographs across the kitchen. Nan hurriedly loops a blue apron around her neck. Carrying a tray of condiments she run-shuffles through a single large door into the front of the restaurant. 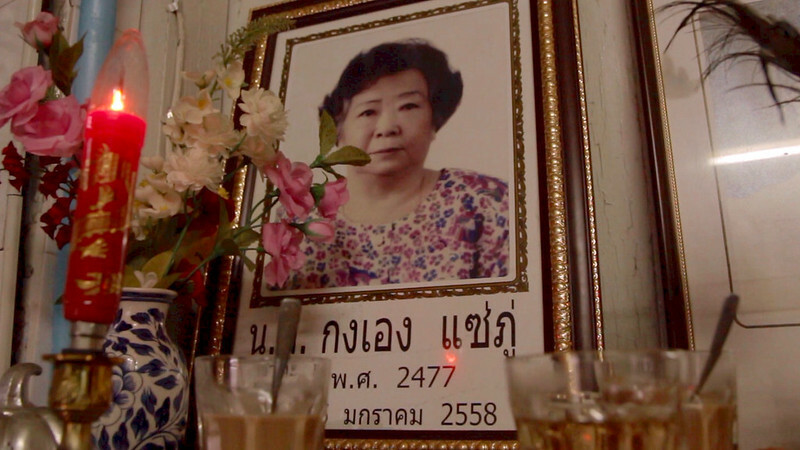 In doing so Nan passes under a sign written in old-fashioned Thai script that reads “Thai Island”. The restaurant dining room is simply one large room. Stuck to the wall are old calendars with pictures of the Thai royal family. The King, wrapped in golden embroidered cloth holds a septer. Underneath, the floor is covered in cracked tiles with antique brown and yellow geometric patterns. Massive four-legged tables sit over the tiles. Each table seats six and is covered with an easy-to-clean vinyl table cloth. 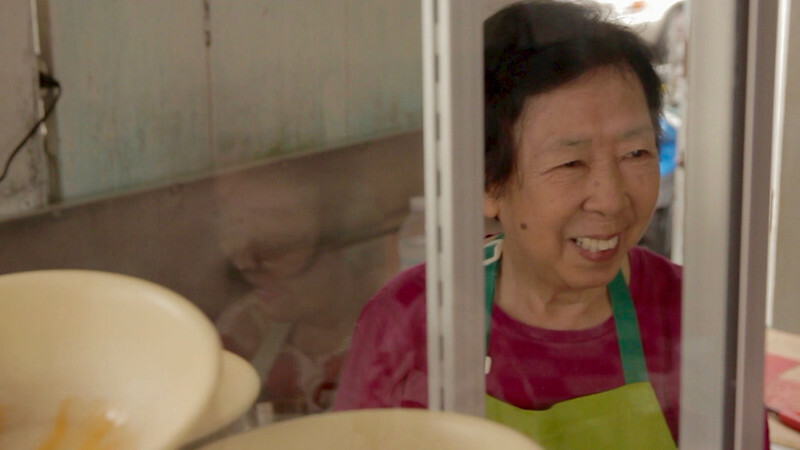 From her tray, Nan sets out clear jars of hot green peppers, crucibles of shaved fresh ginger, plastic bottles of soy sauce as well a plastic napkin dispenser. Tables decked, Nan hurries again farther forward to the entrance of the restaurant. There she unlocks a tall, foldable metal door opening Koh Thai to the street. The morning sun reflects off the surrounding two-story buildings and lights up Koh Thai’s interior pastel-green painted walls. Though the kitchen door come the fat and skinny cooks. They carry in – one handle each – a heavy metal pot of joh. They waddle carefully between the tables. The pot is steaming hot. Finally at the front of the store, in a corner niche with a view of the street and the restaurant, the cooks heave the pot up to a serving stand. A frail, bent-looking, fourth woman gives a quiet nod, ladle in her right bony hand. She stands one step away from the edge of the restaurant’s front stoop to the street. She’s dignified but aged, lips pressing flat together without expression. Her face echoes the same reserved expression as that in the colored photograph overlooking the kitchen. Ms. Leekpai didn’t have children. Her sister also never married. There’s only their nephew left. A first customer walks in. He only has time to speak the briefest word of greeting before Nan calls his order out. As Koh Thai’s first customer of the day sits down, the old sister mechanically reaches for a clean bowl with her left hand. Her right hand stirs around in the pot with the ladle. With purpose she draws the handle up, out of the pot and tips joh into the bowl. Then she dips the handle down again, fishing up two extra, clumps of salted pork. With the contents of the bowl just right, her right hand releases the handle into the pot. Then she takes an egg from the rack overhead, cracks it just so and slips the yolk into the bowl. Casting the shell aside, she sprinkles freshly chopped green onions over the surface. As the last green onion drops into the bowl, almost if choreographed, Nan rushes forward. She softly takes the bowl it from the wrinkled sister’s hands and scoots to their awaiting first customer. He crinkles his eyes in thanks, then leans in over the steaming bowl and begins to eat. Nan rushes away but then back to the table once again, this time carrying a small plate of sliced up bread (palenco) and a half-sized glass filled with weak tea. Soon, two more early morning customers stop in, walking past a yellowing sign at the store’s entrance on the wall. In Thai it reads “Joh with egg 35 Bhat”, “Joh without egg 30 Bhat”. The restaurant fills up, as the day grows. Cars and scooters rumble louder and drown out the quiet of the morning. Except for the traffic, there’s only the soft clank of spoons against bowls and Nan’s voice. She barks out orders and seems to be perpetually in motion. Filled up, Koh Thai’s customers have a look of comfort in their faces. They wave Nan over to pay. She takes their money to the front, makes change from a plastic basket next to the old sister and then carries the rest back. It’s not until 10 AM when the crowd – all at work now – dies down. The old sister sits down and rests. Nan reaches into a pocket in her apron and pulls out a small picture. The Thai sun climbs almost directly overhead, but the restaurant’s old-fashioned floor tiles are still cool. Nan carries a plastic tub to the kitchen filled with bowls coated in globs of uneaten joh. Nan sets down in front of me a bowl of steaming hot joh with egg yolk. I spoon a mouthful and raise it to my lips. Outside the day is hot. From the shade inside Koh Thai, I eat my breakfast and watch people pass on Ngam Ngam road. Pinching a piece of bread, I press it to the bottom of my bowl soaking up a last bite. In my mouth, I commit the smell, taste and texture to memory. Nan leans in, looks directly at me and smiles for the first time that day.